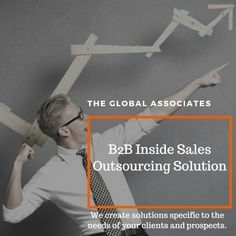 The starting point for The Global Associates Telesales Companies is always to get in touch with the prospective clients and have a nice, fruitful conversation with the aim of developing a long business relationship with them. Mastering the art of conversation thus assumes a great significance for telesales companies in order to taste continuous success. The basic fundamental of sales is that when one wants to sell something, it all starts with a meaningful conversation between two interested parties; it goes forward if one has something useful for the other and both find the deal beneficial for them. The foundation of a long-lasting business relationship between two parties is laid almost always by an energetic, meaningful and productive dialogue. Telesales companies cannot afford to take these initial conversations lightly as their success depends largely on the effectiveness of their sales persons convincing the prospects about the benefits of their products/ services for client organization. Here are some useful tips for mastering this art. You need to understand the prospective buyer well before calling them; doing your homework is the key. You cannot begin on a solid footing without understanding the issues and needs of the organization you want to deal with. This helps you prepare an effective outline for talking to the client. Asking probing, detailed questions about the problems and expectations of the customer is essential for telesales companies to know about their needs and pain points. This convinces the prospect that the company is interested in helping them find solutions for their problems. It’s very important to realize the significance of flexibility in your approach. Going with the flow and molding your conversation according to the customer’s wish and yet leaving a good impression on them is vital.Mastering the art of conversation in order to take a lead to the closing stages is essential for telesales companies. Following the above mentioned tips could help you achieve this objective effectively.